The New York Giants played their last game, a day game against the Pittsburgh Pirates. The next season, the Giants moved to San Francisco, and New York City was without a national league baseball team (since the Dodgers also moved, to Los Angeles). The Polo Grounds, the Giants’ home ballpark on the East River in New York, didn’t host another baseball game until 1962, when the Mets came into the league via expansion. They played two seasons there before moving to Shea Stadium, after which the Polo Grounds was demolished. Of all the old ballparks, the ones I wish I’d seen games in are the Polo Grounds, Ebbets Field, Crosley Field, Shibe Park, and Forbes Field. Shibe Park is at the top of the list, obviously, since I’m a Phillies fan. But the Polo Grounds might be next on the list. 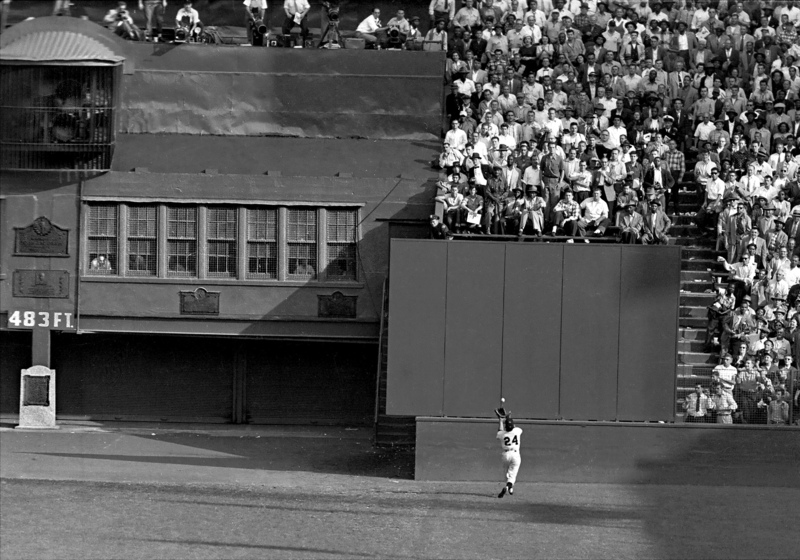 * Willie Mays in the 1954 World Series making “the catch” of a long fly ball off the bat of the Indians’ Vic Wertz. I’ve seen many cropped versions of this photo, but this is the uncropped version. Note the distance to straightaway center field on the facing over the monument to Mays’ left. This means, if I’m any good at estimating from a photo, that Mays caught the ball at around 430-440 feet. Can you imagine hitting a ball 430-plus feet for a long out? 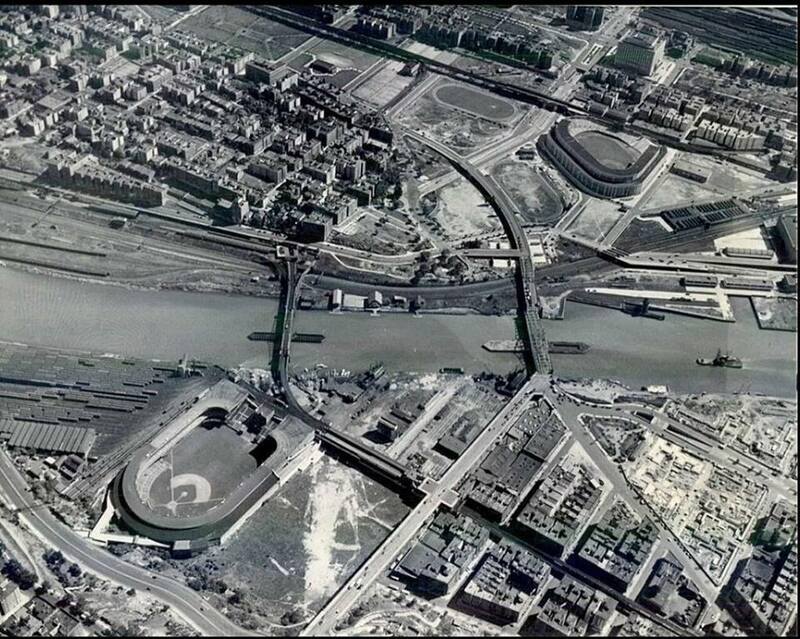 * I never realized, until I saw the aerial picture to the left, how close to each other Yankee Stadium (at the top right of the picture) and the Polo Grounds (at the bottom left) were. Less than a mile separated them as the crow flies. An elevated train ran between the two ballparks, with one stop separating them. It would have been fun to have caught a day game (or game one of a doubleheader) at one and then hopped on the EL and taken in a second game at the other ballpark. 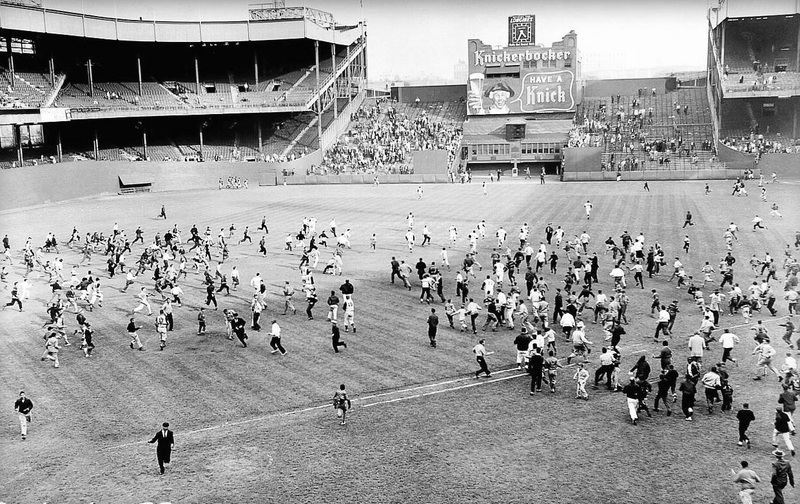 After the Mets moved out following the 1963 season, the Polo Grounds was demolished. A public housing project called Polo Grounds Towers stands on the site of the old ballpark. The former location of home plate is marked, but the only remaining trace of the old stadium is an abandoned stairway which once led from the Polo Grounds ticket office at street level down to the gates of the ballpark. There is more information about and pictures of the stairway, which was recently renovated, here. And for you who know my love for Sinatra and investigated this post thinking there’d be a link to his song “There Used To Be A Ballpark,” click here.